More storage is a constant need for most business, especially during the holiday seasons. 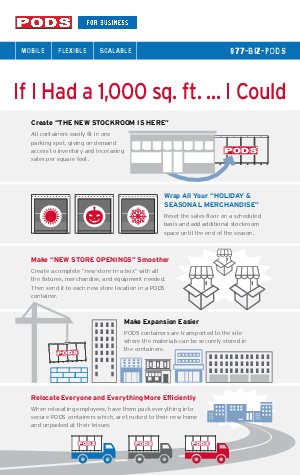 Just 1,000 square feet of storage can help businesses: put an end to delivery fire drills; reduce time consuming stock room tasks; help store holiday and excess inventory more efficiently; simplify new store openings; and allow for a smoother move or relocation process. Embracing PODs For Business storage solutions can accomplish all of these goals and significantly increase your bottom line, improve operations and reduce business disruption.